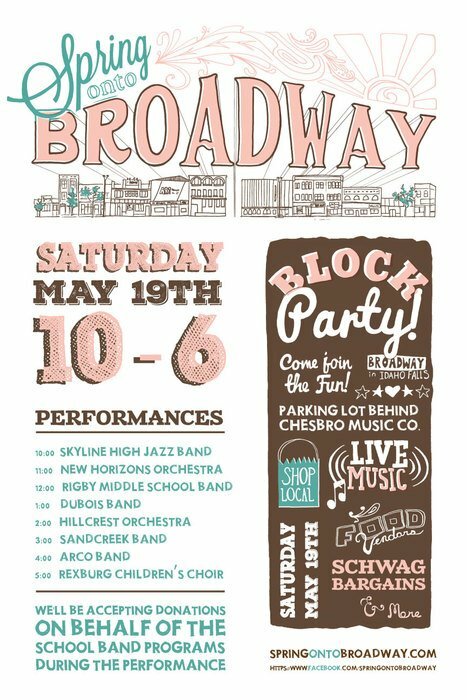 Come one, come all to downtown Idaho Falls on Saturday, May 19th for our annual block party. Many local school bands and choirs will be performing and accepting donations for their music programs. It’s a great cause and a great time. 17 downtown merchants will be participating in the event with specials and sales galore. Reeds Dairy, Carstens’ Bakery and Plum Loco will be there with tasty treats as well. Come celebrate springtime, music and our wonderful downtown community. School bands and Orchestras will be performing on the big stage for your donations for their music programs. Each $20 that is donated to the schools will be entered to win a Fender CD-60CE acoustic/electric guitar! Battle of the Bands: Each School will be tapped and presented on Facebook. Vote for your favorite school and they will get a Battle of the Bands 2018 Trophy. 10% off or 100% rental equality towards intermediate and professional model band and orchestra instruments.